Simon Ghahary is an English born artist, brand architect and lifestyle engineer from the United Kingdom known primarily for his unconventional speaker designs. world-famous Nautilus series at English speaker producer B&W. At this point, the parallel stories of Scandyna and the Podspeakers emerge and take their first steps together into history and out into the world. 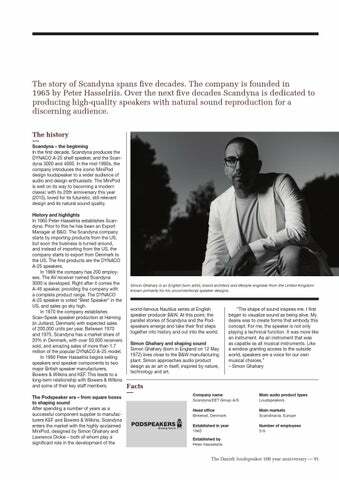 Simon Ghahary and shaping sound Simon Ghahary (born in England on 12 May 1972) lives close to the B&W manufacturing plant. Simon approaches audio product design as an art in itself, inspired by nature, technology and art.